16 December 1971 is a date very memorable to every Bengali national. It is the day where freedom is celebrated after Bangladesh won the Liberation War in 1971, also known as Victory Day. After almost 9 months of fight and struggle to be an independent state and after a lot of sacrifices, Bangladesh finally gained its freedom as an independent country on this day. Every year the people of Bangladesh celebrate this joyous occasion by remembering the sacrifices that were made and the triumph that was achieved by the freedom fighters of 1971. UODA thus celebrates this memorable date every year with its faculty members, teachers and students. 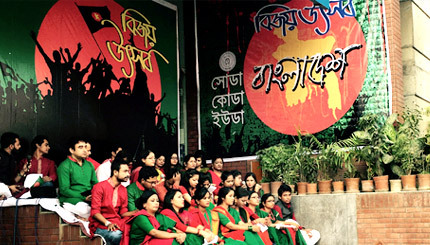 On 16 December 2015, a cultural programme was held by UODA, in which the teachers and students of different departments participated by wearing the national flag colours-green and red to celebrate the Bangladeshi triumph, and performed singing and poetry recitations of national music to capture the sense of joy of the occassion. The programme started off with a procession done by the students and the teachers, led by UODA’s President Professor Mujib Khan,Vice chancellor Professor Dr. Emajuddin Ahamed and Registrar Professor Dr. Iffat Chowdhury. This assembly of students and teachers to celebrate Bangladesh’s Victory Day is a memorable event as everyone gathers to pay respect to the ones we lost in the fight, and to celebrate those who lived to see the birth of Bangladesh. This year as well, the event was a concerted effort to rejoice the triumph of 1971 in its glory. © 2019 University of Development Alternative All Rights Reserved.